The long time data series provided by the Flowbru regional hydrometric network (www.flowbru.be) represents a new opportunity to gain knowledge on the hydrographical system in Brussels. With a combination of data mining analysis, data consolidation, models and in-depth data interpretation, new insights on sewer system performance are obtained. First, the problem of the infiltration of parasitic clear water into the sewer system is addressed. A new methodology is developed to compute the daily volumes of clear water infiltrated in the entire zone treated by the Brussels-North Wastewater Treatment Plant (WWTP). We show the strong seasonal variation of infiltration and how this pattern can be identified in limnimetric time series to highlight sewers which are subject to infiltration. Secondly, the sewer sediment accumulation in the Brussels Right main collector – the largest sewer in the Brussels Region – is studied. The accumulation dynamics are discussed, and a comparison between the present situation and that of the 1980s shows the massive increase in sediment accumulation in recent decades. The potential causes and consequences of this accumulation are discussed briefly. Les longues séries temporelles de données fournies par le réseau hydrométrique régional Flowbru (www.flowbru.be) offrent une nouvelle occasion de mieux comprendre le système hydrographique de Bruxelles. L'exploration et l'analyse de ces données, assorties de leur consolidation, de leur modélisation et de leur interprétation minutieuse, apportent un éclairage nouveau sur les performances du système d'assainissement. En premier lieu, le problème des infiltrations d'eau limpide parasite dans le réseau est abordé. De nouvelles méthodes sont mises au point pour calculer les volumes d'eau claire qui pénètrent quotidiennement dans l'ensemble de la zone traitée par la station d'épuration de Bruxelles-Nord. L'importance des variations saisonnières des infiltrations est mise en lumière, de même que les moyens de détecter ces variations dans les séries temporelles limnimétriques, de façon à repérer les canalisations sujettes à des infiltrations. L'étude porte ensuite sur l'accumulation des sédiments dans le principal collecteur de la Région bruxelloise, à savoir, le grand émissaire de la rive droite du canal. La dynamique de cette accumulation est examinée, puis une comparaison entre la situation actuelle et celle des années 1980 fait apparaître que le phénomène s'est fortement accentué au cours de ces dernières décennies. Les possibles causes et conséquences de cette accumulation sont enfin brièvement évoquées. De langdurig verzamelde gegevens, vrijgegeven door het regionaal hydrometrisch netwerk Flowbru (http://www.flowbru.be) vertegenwoordigen een nieuwe kans om kennis te vergaren over het hydrografisch systeem in Brussel. Via een combinatie van datamininganalyse, gegevensconsolidatie, modellen en diepgaande gegevensinterpretatie, worden nieuwe inzichten over de prestaties van het rioleringssysteem verkregen. Allereerst wordt het probleem van de infiltratie van parasitair helder water in het rioleringssysteem aangekaart. Een nieuwe methode werd ontwikkeld om de dagelijkse hoeveelheden geïnfiltreerd helder water te berekenen in de gehele zone die behandeld wordt door de rioolwaterzuiveringsinstallatie Brussel Noord (RWZI). We tonen de sterke seizoensgebonden infiltratieschommelingen en hoe dit patroon in limnimetrische tijdreeksen kan worden geïdentificeerd om de riolen waar de infiltratie gebeurt aan te duiden. In tweede instantie buigen we ons over de accumulatie van rioolsedimenten in de Brusselse hoofdcollector Rechteroever – de grootste riolering in het Brussels Gewest. De accumulatiedynamiek wordt besproken, en een vergelijking tussen de huidige situatie en die van de jaren 1980 toont de enorme stijging in sedimentaccumulatie in de afgelopen decennia. De mogelijke oorzaken en gevolgen van deze accumulatie worden kort besproken. This work was supported by Innoviris through the Anticipate programme “Capitalizing on hydrometry data series to address Brussels water and wastewater management challenges” (Project 2013-PRFB-32). 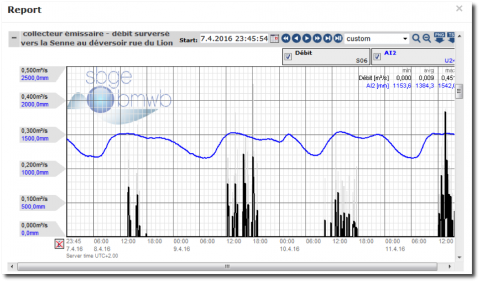 We would like to acknowledge the Flowbru telemetry system operated by the Société Bruxelloise de Gestion des Eaux, and the efficient help provided by Ir Gizèle Bazier (SBGE). 1In the early 2000s, the Brussels-Capital Region installed an extensive teletransmitted limnimeter network providing long time data series in most of the main collectors and bodies of water in Brussels. 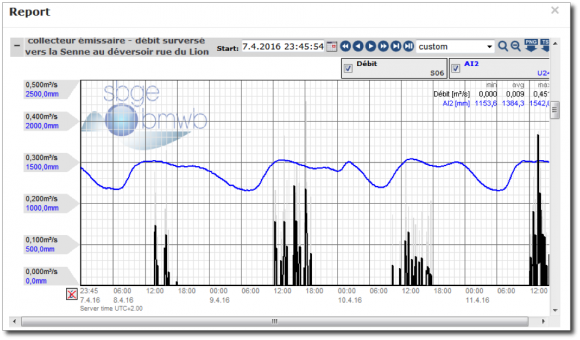 There are 166 sensors which measure parameters such as rainfall in the Brussels Region, water level, flow velocity, water temperature and a number of water quality parameters (www.flowbru.be) [SBGE, 2014]. The many motivations to install this network included the prevention of flooding, the quantification of the Brussels water budget, the measurement of the volumes of wastewater carried by each collector and the improvement of our understanding of the interactions between the sewer system and the natural hydrographical system. This initiative was also an important step towards compliance with the European Water Framework Directive 2000/60/EC (WFD). The WFD directive requires European Union members to monitor their bodies of water, and aims, among other objectives, to restore the favourable ecological status or ecological potential of the different bodies of water. This can only be accomplished if the interactions between the artificial and natural water system are well understood. The first data were recorded around 2005, and every day new data are produced and archived. Long time data series are therefore available. 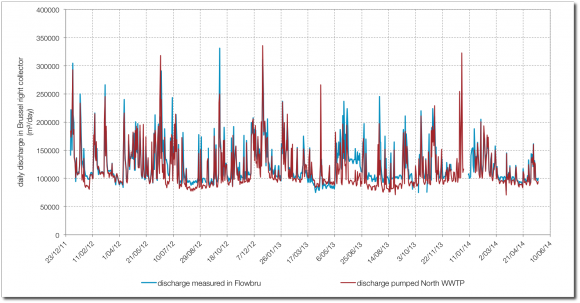 As part of the Innoviris Anticipate programme, the project entitled “Capitalising on hydrometry data to address Brussels water and wastewater management challenges” aims at analysing the Flowbru database to extract knowledge on hydraulic and hydrological performance in Brussels based on the long time data series. 2The challenges of Brussels water management are numerous and varied, and include flood mitigation, ever-increasing imperviousness, river pollution control and sewerage management. Like many old European cities, the combined sewer system of Brussels was built more than a century ago, with one main objective: to evacuate the malodorous and foul wastewater produced by the growing city using every waterway available at the time. Thus many small streams were covered and turned into sewage collectors [van Mierlo, 1878, Alaerts et al., 1980, Kohlbrenner, 2014]. We are left with the legacy of a system which is not suitable for modern water quality requirements. The artificial and natural water systems are intermixed to the point that even today the limits of the different systems are not yet well known. Therefore, water managers and engineers must gather information in order to improve system efficiency and respect river water quality standards while protecting the city from flooding hazards. 3The recently built North WWTP has a wastewater treatment capacity of 1.1 million equivalent inhabitants. The wastewater produced in the Brussels North technical watershed (Figure 1) is transported by the sewage system to the treatment plant and is cleaned before being discharged back to the River Zenne. Since its installation in 2007, the water quality of the Zenne has improved greatly [Brion et al., 2015]. However, the frequent spills of untreated wastewater into the river during rainfall events keep hampering the efforts to attain the favourable ecological status as described in the WFD. 4One of the key nodes in the Brussels sewer system is the combined sewer overflow (CSO) structure of the New Maelbeek collector, located in Rue du Lion in the north of Brussels (Neder-over-Hembeek). It is by far the most important wastewater overflow structure in Brussels in terms of triggering frequency and overflowed volumes. The wastewater produced in the Maelbeek catchment (Figure 1) (Brussels centre, Schaerbeek, Evere, Saint-Josse-ten-Node, Ixelles, Etterbeek, for a total surface of 36 km²) is guided towards the North WWTP through the Brussels Right collector. When it rains, the excess volumes that cannot be accepted in the treatment plant are evacuated by the overflow structure towards the River Zenne, the idea being to evacuate as quickly as possible the extra water from Brussels by the river to protect the city from flooding, irrespectively of its pollutant content [Guyaux, 1968, Verbanck et al., 1994a]. The green area shows the Maelbeek catchment with the New Maelbeek Overflow structure (blue star). The brown lines show the Brussels main collectors and the red line highlights the Brussels Right collector. The blue line represents roughly the limits of the Brussels North technical watershed. 5This kind of structure is vital in densely populated cities drained by combined sewers, as the amount of impervious surfaces is so considerable [Vanhuysse et al., 2006] that the runoff water cannot be treated fast enough by the WWTP. However, the WFD aims at limiting the frequency of overflow, as it is triggered only by exceptional rainfall. The final decision of the maximum number of CSOs is under the remit of EU member states, and European countries tend to limit the maximum number of CSOs to 20 events per year [Malgrat, 2016]. Table 1 shows that with more than 150 overflow events a year1, Brussels is far from this objective. The impact of this overflow structure on the River Zenne water quality is significant, as the wastewater – besides the fact that it is mixed up with runoff water – is concentrated in easily biodegradable matter that creates oxygen depletion in the river [Le et al. 2014]. This creates anoxic conditions that are damageable for the living animals in the river. Furthermore, metallic pollutants produced by road traffic such as zinc, cadmium or lead, together with polycyclic aromatic hydrocarbons (PAH), are washed off from roads by rainfall and transported by the runoff water in the sewer and then in the river by CSO spills [Petrovic et al., 2012, Brion et al., 2012]. These pollutants tend to accumulate in the river sediments and are a major impediment to aquatic life development. Therefore, structural work as well as management strategies need to be developed and implemented in order to reduce the frequency and impact of CSO events. 6The objective of this work is to identify whether extraneous bodies in the sewer system influence the frequency and volumes of storm water overflowed into the River Zenne and what could be gained by limiting these occurrences and their influence. 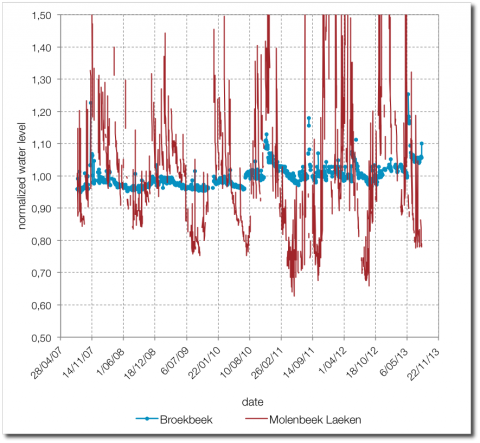 In this study, based on a systematic inspection and analysis of the long time data series available in Flowbru, two influencing factors have been identified: the parasitic clear water infiltration2 and excessive sewer sediment accumulation. 7Firstly, a new methodology has been developed to quantify on a day-to-day basis the clear water infiltrated volumes treated by the North WWTP. The consequence of the infiltration on sewer system efficiency is addressed and the possible gain that could be achieved by limiting it is discussed. 8Secondly, via a simple data consolidation approach, the evolution of the sewer sediment height near the overflow structure is computed. Computational techniques are implemented to increase the temporal span of the data time series, and the dynamics of sediment accumulation is studied. 9Parasitic clear water is defined as water devoid of organic and inorganic pollutants that enters the sewer system through wrong connections or broken pipes. There are multiple locations where groundwater and small streams enter the sewer system. There are even places where this is done on purpose so as to keep the water table elevation under control at a certain level. However this additional water can increase the water level in the sewer significantly during dry weather conditions as well as the amount of water that needs to be treated at the WWTP. Therefore, it is important to know the volumes of parasitic clear water infiltration along with its inter-annual and seasonal variations. 10Several methods to quantify the infiltrated clear water have been developed in the past few decades. Those methods can be based on high-temporal water quality monitoring such as chemical oxygen demand (COD) or water sample analysis to determine the isotopic signature of the different sources of water [Bertrand-Krajewski et al., 2006, Houhou et al., 2010, Bareš et al., 2012]. These methods have proven to work well in different locations but can be difficult to implement. They also need considerable input in terms of time and money [Bertrand-Krajewski et al. 2006]. 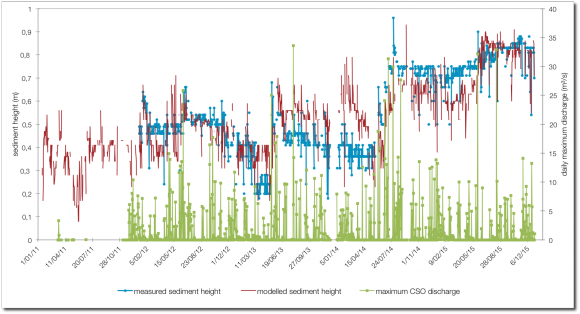 The ever-growing amount of hydrometry data in modern cities represents an opportunity to study the infiltration pattern without a need for complex and costly analytical surveys to be conducted. The present study proposes a method to quantify the parasitic clear water based on a simple water quantity budget and an anthropogenic tracer detected at the outlet of the drainage system, namely ammonium nitrogen NH4+. 11For dry weather days, the water that enters the North WWTP is the sum of the wastewater and the infiltrated parasitic clear water. To calculate the amount of wastewater produced every day by Brussels inhabitants we used an anthropogenic tracer, ammonium nitrogen, to represent the presence and activities of Brussels citizens. Ammonium has the advantage of being fairly conservative during the journey in the sewers [Almeida et al., 2000]. This means that ammonium does not degrade and the total amount of ammonium measured at the inlet of the WWTP is the sum of the houses/activities released in the catchment. We use this anthropogenic tracer to calculate as precisely as possible the maximum wastewater produced in one day in the north of Brussels. Then we compute the daily variation from this maximum with the variation in drinking water consumption volumes. This means that we make the assumption that the volume of wastewater produced every day is directly correlated to the amount of drinking water consumed in the city. The infiltration can therefore be computed with Equation 1. 12With Qinfiltration= daily volumes of clear water infiltration [m³/day], Qwwtp=daily volume treated at the Brussels North WWTP [m³/day], mNH4-N.max=Maximum load of ammoniacal nitrogen entering the WWTP [kg/day], kNH4-N=daily production of ammoniacal nitrogen per inhabitant per day [kg/inh/day], Qinh.day=daily production of wastewater per inhabitants per day [m³/inh/day] and IDistr= daily drinking water distribution index [-]. 13Figure 2 shows the results from mid-2008 to mid-2015. We add a trend curve to help visualise the general trend. This is the clear water infiltration for the entire zone treated by the Brussels North WWTP. The red squares show the infiltrated volumes computed during dry days, and the blue line shows the general trend. 14This diagram teaches us two things. 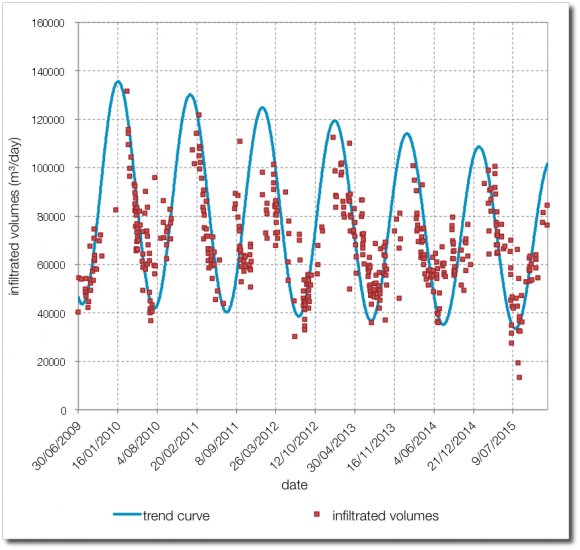 Firstly, we can see that as expected, there is a strong variation in the infiltrated volumes over a year, with volumes of approximately 120 000 m³/day in winter and 40 000 m³/day in summer. This seasonal variation has also been measured in the Ypresian water table located in the northern part of Brussels [IBGE, 2011] and confirms the close link between the sewer system and the surrounding groundwater table. In total, infiltration represents approximately 24 % of the total volume treated in the North WWTP each year. A reduction in the amount of infiltrated water would therefore certainly be beneficial in order to reduce the operational costs of the treatment plant. Secondly, we see that there has been a small decrease in infiltration over the years. This could be due to the recent disconnection and sewer repair works begun a few years ago [IBGE, 2016]. 15Once the seasonal infiltrated pattern is understood, it can be used to flag collectors quickly when they show the same pattern and can therefore be labelled as porous collectors. 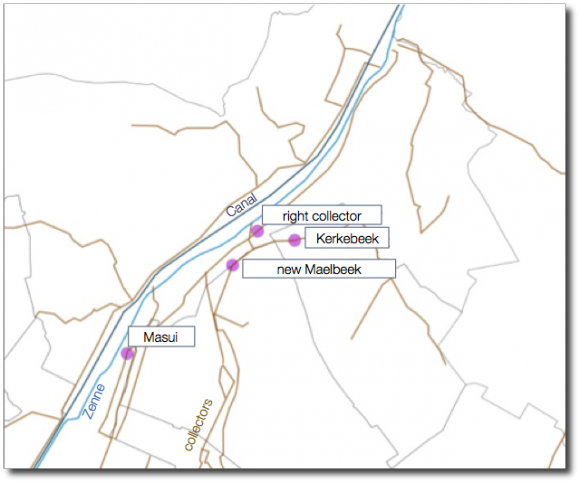 Figure 3 shows two examples: the Molenbeek-Laeken collector, which is strongly affected by infiltration, and the Broekbeek collector (located in Anderlecht), which is devoid of any clear water [ULB-DWPC, 1992]. Such basic water level information is available in many sewers in Brussels, and therefore the same comparison can be made easily for each of them in order to highlight sewers which are strongly affected by infiltration. The red line represents the Molenbeek-Laeken collector and the blue dots, the Broekbeek collector. 16This type of diagram may also help to assess the impact of sewer renovation programmes in the local catchment. Evaluating the exact benefits from the reduction of parasitic clear water is not an insignificant task, as the effect is hidden by the seasonal and multi-annual variations. By replicating this type of study and obtaining details regarding many collectors, this objective may be pursued. This is particularly important when considering the operational and ecological objectives, which are not always compatible, especially in a context with investment limitations and restrictive European regulations. The positive and negative aspects of limiting parasitic clear water are detailed below. 17Operational costs that are spent mainly on pumping the water at the inlet of the treatment plant have already been mentioned. A second positive impact would be obtained by directing clean infiltrated water towards the “blue network” (Maillage Bleu) to help restore the quantitative aspect of the hydrographical network in Brussels. For instance, the River Woluwe located in the eastern part of Brussels would gain from higher discharge during low flow periods, making it less vulnerable to pollution spills. Furthermore, clear water increases the water level in the collector during dry weather periods. When the runoff water enters the sewer system during rainfall events, the overflow threshold is reached more easily, and the overflow frequency and associated volumes are therefore increased by this extra clear water. However, the impact of a reduction in infiltration on the CSO frequency would remain limited, as the runoff discharge is significantly greater than the dry weather discharge. A complete abatement of parasitic clear water would decrease the frequency of CSOs every year but would certainly not be enough to comply with the maximum number of CSOs permitted each year [de Ville, 2017a]. 18On the other hand (and this has not been sufficiently reported in the technical literature so far), this extraneous clear water in the drainage system helps maintain a minimal self-cleansing capacity of the sewer [de Ville, 2017b]. For instance, during the nocturnal low flow, clear water helps to keep a minimal flow velocity that carries the sewer sediments and pollutants towards the treatment plant. A significant reduction in the clear water in sewers with low slope rates would decrease the driving force of the flow and reduce the amount of solids transported, thus increasing the sedimentation in the collector. The resulting cost reduction in treatment plant operations would be compensated at least in part by an increase in sewer maintenance costs. A more detailed financial study should be performed to confirm this hypothesis. 19Finally, it must be underlined that infiltration is allowed to occur in some areas of Brussels – especially in the western part of the urban area – in order to keep the water table low enough (and to avoid having to add excess weight to the conduit structure). Reducing this component of infiltration is neither realistic nor desirable, as it could lead to an increase in the amount of basement flooding. The optimistic scenario of a complete reduction in clear water is therefore not conceivable. Based on these elements, different strategies should be developed for the different parts of Brussels. The eastern part, for instance, is characterised by steep slopes, and the wastewater flow velocity is therefore naturally fast, which creates a favourable self-cleansing capacity. A strategy to reduce infiltration in this part of the city would therefore have mostly positive impacts. On the contrary, the western parts of Brussels (and the low ground immediately adjacent to the Zenne valley) are characterised by low slopes, and the additional clear water therefore helps to keep the sewer as clean as possible and at the same time keep the water table under control. 20The second aspect studied is the accumulation of sewer sediment in the Brussels Right collector and its influence on the CSO frequency. Again, the purpose is to capitalise on the available long time data series in Flowbru. Figure 4 shows the volume measured in the collector upstream from the North WWTP and the volume pumped at the inlet of the WWTP. The two volumes should be similar as there are no major inputs or losses between the two measurement points. We can see that sometimes the two discharges are very close to each other, and sometimes there are small or even big differences. To understand why, we first need to assess the different measuring principles. 21The water discharges recorded at the inlet of the North WWTP correspond to actual pumped volumes. It is therefore real and relatively precise volumetric information. The discharges computed inside the collector are measured with a limnimeter and a current meter. The discharge is therefore calculated by the combination of the two measurements. However the measurement of the water level is greatly affected by the sediment accumulation under the sensor. For an identical flow rate to be transported, the more deposited sand there is in the collector, the higher the water level will be. Therefore the computed discharge will be overestimated. 22The discharge provided by Flowbru is computed with the radar current meter information (Uradar) and the water level measured by the limnimeter. This water level is converted into a cross section (Stotal [m²]) but to compute the discharge correctly, we need to remove the cross-section area occupied by the sediments (Equation 2). In such a case, Equation 2 provides the correct way to compute the discharge in the collector. 23With Qcomputed= calculated discharge with Flowbru sensors (m3/s), Uradar= measured flow velocity (m/s), Stotal= cross section measured by the limnimeter and Ssed= cross-section area of the sediment layer. 25By combining Equation 2 and Equation 3, we may simply reconstruct the sediment cross section around the sensors (Equation 4). It must be mentioned that Equation 4 is pertinent mainly in the direct vicinity of the sensors and cannot be extrapolated to the entire collector. It provides more of an insight on the dynamics of sediment accumulation rather than serving as a tool for the quantification of sediment volume in the entire collector. 26The relevance of such an approach becomes greater as the length of the data time series increases. Although it is useful information, a single value of sediment height does not provide insight regarding long-term dynamics. However, a time series of sediment height is much more useful despite the fact that the relevance of the measurement is local (in the vicinity of the sensors). Therefore, in order to maximise the use of the information available in the Flowbru database, a Neural Network (NN) model has been developed to expand the missing data time series for the year 2011. This type of model is fairly simple to implement and can increase the usefulness of large databases such as Flowbru considerably by adding missing data or by modelling variables that are not easily measurable (e.g. flow discharge or flow velocity). 27The Neural Network model aims to mimic the way the human brain works by creating several layers of multiple neurons. These layers of neurons are trained to react similarly to the studied system. Several inputs are feed-forwarded in the model with an associated target. The model is trained until it is able to find the right target for a given set of inputs [Schmidhuber, 2015]. In this application, we want to model the water level and flow velocity in the Brussels Right collector for the year 2011. Two models have been developed: one for each time series defined as the targets of the models. The inputs we have chosen are water levels measured in the nearby sewer system. 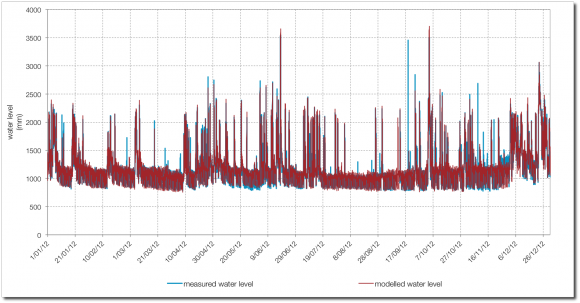 Figure 5 shows the three water level time-series selected. The choice was fairly straightforward, as there is a hydraulic link between the four points, and a change in one of the four points would therefore have an impact on the others. As we are in a city, the signal during dry weather flow has a repetitive pattern, which depends on the month, the day and the hour of the day [Butler and Graham, 1995]. These three additional pieces of information are added as input to the model. In total, these are the six inputs selected to model the water level and the flow velocity in the Brussels Right collector. 28Figure 6 shows the results of the NN model for water level determination. The precise determination coefficient ensures the excellent prediction capabilities of the model. 29With the data series reconstructed in 2011, we are able to model the sediment height evolution in the Brussels Right Collector near the sensors from 2011 to 2016. Figure 7 shows the results. The sediment layer computed with the measured water level and flow velocity is shown in blue, while the sediment layer computed with the modelled variables is shown in green. We can see that the Neural Network works well, as the two curves generally follow the same trend with the same amplitude. Based on this observation, the sediment evolution shown by the model in 2011 seems reliable. 30Between 2011 and 2014, the sediment layer remained stable at a thickness of approximately 40-50 cm, with a small decrease in March 2013. Then in June 2014, there was a major increase in the thickness of the sediment layer. The layer increased up to 80 cm and kept increasing until the end of 2016. 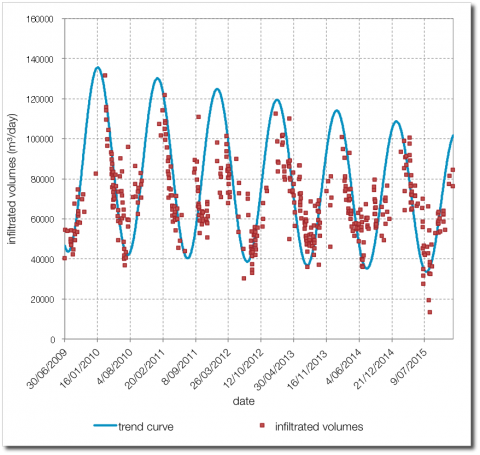 One clear pattern that can be identified is that each significant increase in the sediment layer occurred at the beginning of the summer period (May-July 2011-2015). Each year, the same pattern was visible and can be explained by two elements. First, in order for there to be an increase in the sediment layer, sediments need to be available. This corresponds to the structural works that take place each year at the same time in Brussels. Secondly, the sediments are flushed into the sewer system by the intense summer storms. It can be shown that each significant increase in the sediment layer thickness is associated with an intense storm (marked by a significant discharge recorded in the New Maelbeek CSO) (Figure 7). The amount of water that enters the sewer causes it to become saturated quickly, the hydraulic grade line flattens considerably and the water velocity decreases to almost zero meters per second. At that time, the collector acts as a huge sedimentation tank and the amount of sediment in the bottom of the collector increases. This is hugely significant because sediments have several impacts on the efficiency of the sewer system. They reduce the space available for the water to flow and increase the flow resistance. 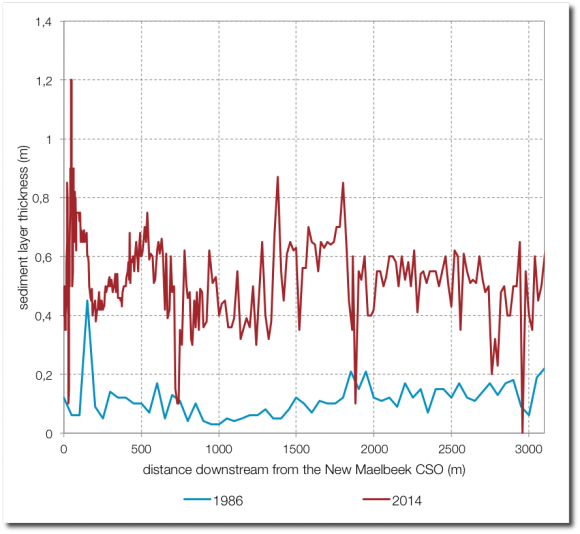 The consequence is an increase in the frequency of CSOs at the New Maelbeek overflow structure, with 188 CSOs in 2015 when the sediment layer was approximately 80 cm thick, and only 104 in 2013 (Table 1) despite the fact that there was more rain in 2013 than in 2015 [Statbel, 2016]. What is even more worrying is that CSOs have been recorded recently in dry weather conditions, thus proving that the sewer system is becoming saturated with sediments (Figure 8). 31The present methodology has the advantage of providing insight into the long-term evolution, but we must bear in mind that it provides local information which is valid only in the immediate proximity of the sensors. Therefore we organised with Vivaqua a sediment field survey of the sewer starting at the New Maelbeek CSO to the North WWTP. Figure 9 also shows the same survey that was conducted in 1986 in the collector [Verbanck, 1992]. 32We can see that the amount of sediment present in the collector has increased greatly since the mid-1980s. In terms of volume, the comparison with the end of the 1980s is even more striking. The volume of sediments in the last part of the Brussels main collector is five times greater than it was 25 years ago, with 2500 m³ (compared to 500 m³ in the 1980s). This is due to the fact that sewers are no longer cleaned on a regular basis. Previously, an iron cleaning trolley was moved along the collector to flush sediments down to the treatment plant. However the use of the cleaning trolley has been discontinued for several years, but it is still visible 700 metres downstream from the New Maelbeek CSO (rue du Lion). 33This accumulation of sediments is a major concern with respect to the efficiency of the sewage system, as it is known that sediment accumulation represents an increase in the flow roughness and decreases the hydraulic conveyance of the drainage network. The frequency of CSOs and associated volumes are therefore increased significantly by the accumulation of sediments. Sediments also create an environment suitable for corrosive and dangerous gas production, which accelerates the degradation of the sewer and increases the occupational hazards for sewer maintenance crew. Finally, it is known that over time, sediments tend to consolidate due to biological, physical and chemical processes, thus making its removal more and more challenging [Ashley et al., 2004]. A semi-distributed hydrological model developed in EPA SWMM shows that the overflowed volumes could be reduced by about 50 % in a perfectly clean sewer system [de Ville, 2017a]. This reduction estimate must be interpreted with some caution, as modelling results are influenced by many uncertainties. Nevertheless, the reduction of CSO frequency is expected to be significant with a clean sewer. 34In the early 2000s, Brussels installed an extensive teletransmitted limnimeter network (www.flowbru.be) that provides long time data series in many Brussels collectors. Water level, flow velocities, temperature, rainfall and even some water quality data are now available on a real-time basis. This extensive network was installed by the Société Bruxelloise de Gestion de l’Eau (SBGE) with the objective of increasing our understanding of hydraulic performance in Brussels and the connections that exist between the different bodies of water. Nowadays, extensive long time data series are available and provide a unique opportunity to study the long-term evolution of the Brussels sewer system. 35This work focused on one of the most challenging nodes of the Brussels sewer system with respect to the protection of the River Zenne, namely the overflow structure of the New Maelbeek collector located in rue du Lion, which is the biggest CSO infrastructure in Brussels. The purpose of this combined sewer overflow (CSO) is to evacuate the excess water that cannot be treated by the North WWTP during rainfall/runoff events into the River Zenne. This CSO is an essential structure required to protect the centre of Brussels from flooding. However, the European Water Framework Directive of 2000 insists on the fact that such structures should only be triggered during intense rainfall events. Although the maximum number of overflow events allowed each year is determined by the EU Member States and a number has not yet been decided on for Brussels, the limits chosen by neighbour countries never exceed 20 overflows per year. Nowadays, the structure is used approximately 150 times per year and even operates during dry weather flow due to sediment accumulation and poor maintenance. The consequence of these frequent overflow events is that the water quality of the River Zenne is greatly affected, limiting the possibility for the development of significant aquatic life. Furthermore, pollutants tend to accumulate in the river sediment thus increasing the impact of wastewater overflow in the long term. The recently built WWTPs have improved the water quality of the River Zenne considerably, but as long as there are so many CSOs each year, the river will remain polluted and water quality standards will not be complied with easily. 36The present work is aimed at identifying the extraneous elements present in the Brussels sewer system and at studying the possible impact they have on the frequency of CSOs and the associated overflow volumes. Two elements have been studied in detail, namely parasitic clear water infiltration and sewer sediment accumulation. 37We developed a simple method based on a water budget and an anthropogenic tracer – ammonium nitrogen – to quantify day-by-day the infiltrated volumes in the drainage area served by Brussels North WWTP. Results show that infiltration is three times greater in winter (with approximately 120 000 m³/day) than in summer. By comparing the different years beginning in 2008 until the middle of 2015, we show that there was a small decrease in the amount of infiltration in the north technical watershed each year. This could be due to the recent repair works and drainage system disconnections. 38Nevertheless, one has to be aware that a significant reduction in clear water would have both positive and negative impacts. 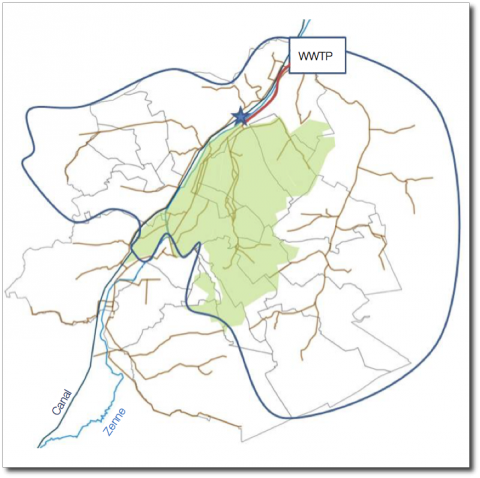 Beside a possible reduction in the WWTP operational costs, the transfer of the extraneous water to the natural “blue network” would help restore quantitatively precarious bodies of water such as the Zenne and the Woluwe. One of the strategies for reducing the impact of pollution spills is to increase the flow of rivers. It is known, however, that infiltrated clear water also helps to enhance the self-cleansing capacity of sewers. This means that a reduction in infiltration will probably lead to more intense sewer deposit accumulation, and that some of the operational cost savings would be counterbalanced at least in part by an increase in the frequency of sewer cleaning requirements. In conclusion, we show that the yearly pattern of infiltration can be identified in the baseline evolution of sewer limnimetric data series during dry days, thus providing an easy way to spot individual sewers that are strongly subject to infiltration. The monitoring of parasitic clear water infiltration with Flowbru will help to adapt the sewer renovation/transformation programmes to the local environmental and operational objectives and the optimum proportion of parasitic water in the different sewers. 39The second element studied is the accumulation of sewer sediments in the Brussels Right collector from 2011 to 2016. The methodology developed in this paper is based on a comparison of the discharge measured according to two different measuring principles. The first one is the volume pumped at the inlet of the WWTP and is not influenced by the thickness of the sediment layer. The second one is calculated using the water level and the flow velocity information measured inside the collector, and is strongly affected by sediment deposits. Of course, the more sediment there is, the higher the water level will be, and the calculated discharge is therefore overestimated. By comparing the two discharges, we can easily compute the sediment layer thickness in the vicinity of the sensors. Data have been recorded since the beginning of 2012. 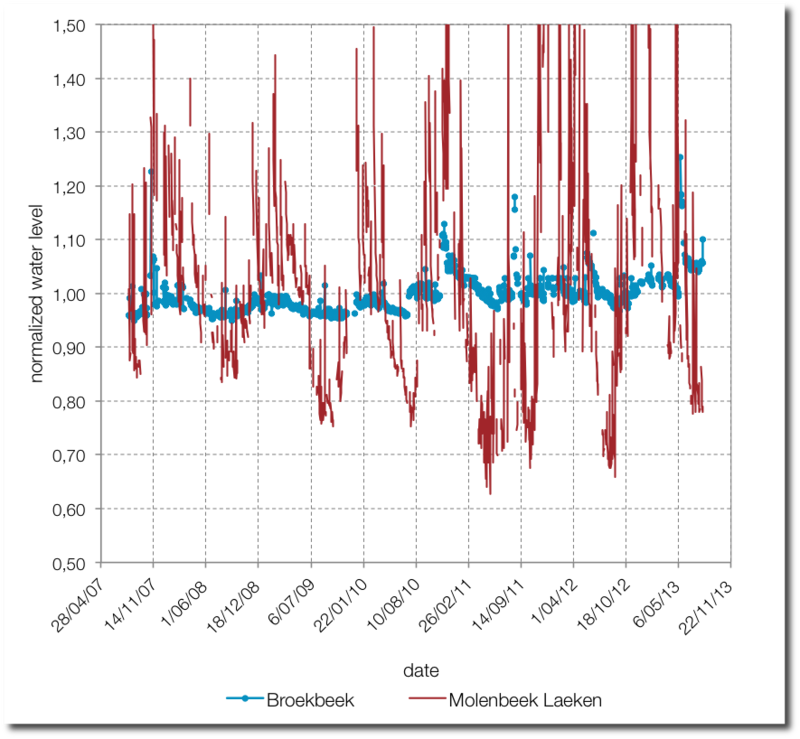 However, with the idea of capitalising on the data available in the Flowbru database and extending the length of the time series available, we have developed a Neural Network model to reconstruct the missing data from 2011. Using the water levels measured in different locations that are hydraulically connected to the Right Collector, we were able to build a precise model that computes the water level and flow velocity in 2011 in the Brussels Right Collector. These new computed data were used to implement the methodology for determining the thickness of the sediment layer. 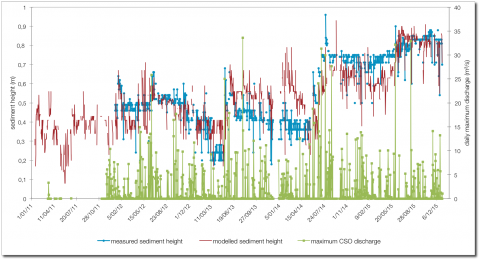 Results show an increase in the sediment layer thickness since 2014 that has never been observed before. While the sediment layer remained at approximately 40 cm thick most of the time, in June 2014 it increased significantly up to 80 cm due to a succession of intense storms. This information has a local relevance and is difficult to extrapolate to the entire Right collector, which is why we organised a field survey with Vivaqua covering 3 km of the collector between the New Maelbeek CSO and the North WWTP. While validating the height of the computed sediments, the survey also shows that the volume of sediment present in the collector is approximately 2500 m³, which is five times greater than it was in the mid-80s. 40This is a major source of concern given that sediment accumulation represents an increase in flow roughness and a decrease in the available space for the water to flow. The frequency of CSOs and associated volumes are therefore significantly increased, and some overflows have been documented recently in dry weather flow conditions. This is a clear indication that the sewer system in that part of Brussels is totally saturated with sediment deposits. Therefore, a new strategy for cleaning the sewer needs to be developed quickly in order to avoid a complete clogging of the main sewer of Brussels. 41A thorough understanding of the long-term dynamics of both elements, as presented in this paper, is the key to better management and efficiency of the sewer system in Brussels, and the Flowbru regional hydrometric network, together with data from the North Plant, is essential in order to achieve this understanding. Furthermore, the relevance of the Flowbru database will only increase over time as the evolution of the performance of the hydrographic system performance in Brussels will be documented and the impact of present and future management policies will be quantifiable. ALAERTS, G., WILMS, D., VAN HAUTE, A., AERTGEERTS, R., VANDERBORGHT, J.-P. and WOLLAST, R., 1980. Onderzoek van het afval water van de Brusselse agglomeratie. In: Het Ingenieursblad. 1980. Vol. 49, pp. 118–26. ALMEIDA, M., BUTLER, D., and MATOS, J., 2000. In-sewer biodegradation study at the Costa do Estoril interceptor system. In: Urban Water. 2000. Vol. 2, No 4, pp. 327–334. ASHLEY, R.M., BERTRAND-KRAJEWSKI, J.-L., HVITVED-JACOBSEN, T. and VERBANCK, M.A., 2004. Solids in sewers. IWA Publishing (ed. ), Scientific & Technical Report No 14, May 2004, ISBN 1-90-022291-4, 340 p.
BARES, V., STRANSKY, D., and SYKORA, P., 2012. Evaluation of sewer infiltration/inflow using COD mass flux method: case study in Prague. In: Water Science And Technology. 2012. Vol. 66, No 3, pp. 673–680. BERTRAND-KRAJEWSKI, J.-L., CARDOSO, M., ELLIS, B., FREHMANN, T., GIULIANELLI, M., GUJER, W., KREBS, P., PLISKA, Z., POLLERT, J. and PRYL, K., 2006. Towards a better knowledge and management of infiltration and exfiltration in sewer systems: the APUSS project. In: Water Practice and Technology. 2006. Vol. 1, No 1. BRION, N., SERVAIS, P., BAUWENS, W., VERBANCK, M.A., WYNANTS, M. and NUYTTENS, G., 2012. Past and present chemical and microbiological quality of the Zenne River: Impact of the Brussels’ sewage management. In: VUBPRESS (ed. ), Bridges over troubles water. Brussels. pp. 251–264. BRION, N., VERBANCK, M.A., BAUWENS, W., ELSKENS, M., CHEN, M., and SERVAIS, P., 2015. Assessing the impacts of wastewater treatment implementation on the water quality of a small urban river over the past 40 years. In: Environmental Science and Pollution Research. 2015. Vol. 22, No 16, pp. 12720-12736. BUTLER, D. and GRAHAM, N., 1995. Modeling dry weather wastewater flow in sewer networks. In: Journal of environmental engineering. 1995. Vol. 121, No 2, pp. 161–173. GUYAUX, J., 1968. L’assainissement de la vallée du Maelbeek. In : Crédit Communal de Belgique. 1968. Vol. 85, pp. 154-163. DE VILLE, N. and VERBANCK, M.A., 2017a. Capitalizing on hydrometry data series to address Brussels Water and Wastewater management Challenges. In: Anticipate Symposium. Conference. Brussels, 30th March 2017. DE VILLE, N., LE, H.M., SCHMIDT L. and VERBANCK, M.A, 2017b. Data-mining analysis of in-sewer infiltration patterns: seasonal characteristics of clear water seepage into Brussels main sewers. In: Urban Water Journal, Submitted. HVITVED-JACOBSEN, T., VOLLERTSEN, J. and NIELSEN, A.H., 2013. Sewer processes: microbial and chemical process engineering of sewer networks. 2nd ed., CRC press. HOUHOU, J., LARTIGES, B., France-LANORD, C., GUILMETTE, C., POIX, S. and MUSTIN, C., 2010. Isotopic tracing of clear water sources in an urban sewer: A combined water and dissolved sulfate stable isotope approach. In: Water Research. 2010. Vol. 44, No 1, pp. 256–266. IBGE, 2011. Environmental impact assessment report of the water management plan for the Brussels region. Brussels. Bruxelles-Environnement. IBGE, 2016. Projet de plan de gestion de l’eau de la region de Bruxelles-Capitale 2016-2021. Brussels. Bruxelles-Environnement. KOHLBRENNER, A., 2014. From fertiliser to waste, land to river: a history of excrement in Brussels. In: Brussels Studies. 2014. No 78, 23 June 2014, www.brusselsstudies.be. LE, H.M., PETROVIC, D. and VERBANCK, M.A., 2014. The semi-sewer river: hydraulic backwater effects and combined sewer overflow reverse flows in Central Brussels reduce deoxygenation impact further downstream. In: Water Science and Technology. 2014. Vol. 69, pp. 903-908. MALGRAT, P., 2016. A challenge for policy makers and the water sector: Different policy perspectives on CSOs from across Europe. In: EurEau Workshop on Combined Sewer Overflows. Conference. Antwerp University, 1 February 2016. NOVATECH, 2016. Proceedings of the 9th conference on Planning & technologies for sustainable urban water management. Conference. Lyon, 28 June- 1 July 2016. PETROVIC, D., BRION, N., MAGNIER, A., ELSKENS, M. and VERBANCK, M.A., 2012. Effect of intense rainfall events on metallic and particulate pollutant fluxes in a small urban watercourse. In: 9th International Conference on Urban Drainage Modelling. Conference. Belgrade, Serbia, 3-6 September 2012. SBGE, 2014. Le Traitement des eaux usées en Région de Bruxelles-Capitale. Bruxelles. Rapport d’activités. SCHMIDHUBER, J., 2015. Deep learning in neural networks: An overview. In: Neural Networks. 2015. Vol. 61, pp. 85–117. STATBEL, 2016. http://statbel.fgov.be/fr/statistiques/chiffres/environnement/climat/. Website visited on the 12th March 2017. ULB-DWPC, 1992. Réseau de surveillance des écoulements et des charges polluantes dans les collecteurs d’amenée à la future station d’épuration de Bruxelles – Nord. Bruxelles. VAN MIERLO, C., 1878. Notice descriptive et historique concernant les égouts et la Senne à Bruxelles. Brussels: Baertsoen. VANHUYSSE, S., DEPIREUX, J., and WOLFF, E., 2006. Etude de l’évolution de l’imperméabilisation du sol en région de Bruxelles-Capitale. Bruxelles. ULB-Igeat. VERBANCK, M.A., 1992. Field investigations on sediment occurrence and behaviour in Brussels combined sewers. In: Water Science and Technology. 1992. Vol. 25, No 8, pp. 71-82. VERBANCK, M.A., 1993. A new method for the identification of infiltration waters in sanitary flows. In: Water Science and Technology. 1993. Vol. 27, No 12, pp. 227–230. VERBANCK, M.A., WOLLAST, P. and VANDERBORGHT, J-P, 1994a. Contribution des épisodes pluvio-orageux à la charge polluante annuelle évacuée par le réseau unitaire Maelbeek-Emissaire de Bruxelles. In : La Houille Blanche. 1994. No 1/2, pp. 41-50. VERBANCK, M.A., ASHLEY, R.M. and BACHOC, A., 1994b. International workshop on origin, occurrence and behaviour of sediments in sewer systems: Summary of conclusions. In: Water research. 1994. Vol. 28, No 1, pp. 187–194. 1 One CSO event is defined in this work as a discharge recorded in the New Maelbeek CSO that lasts at least 10 minutes (two measures) and is preceded and followed by three hours of dry weather conditions (no overflow measured). 2 In this study, infiltration includes all of the sources of parasitic clear water that enter the sewer system. This includes, among other sources, groundwater infiltration and stream inflow (e.g. the Molenbeek stream).